Property Location A stay at The Links Golf and Racquet Club places you in the heart of North Myrtle Beach, convenient to Beachwood Golf Club and Professor Hacker&apos;s Lost Treasure Golf. This condominium resort is within close proximity of Mayday Golf and Azalea Sands Golf Club.Rooms Make yourself at home in one of the 30 air-conditioned rooms featuring fireplaces. Rooms have private balconies. Kitchens are outfitted with refrigerators, microwaves, and dishwashers. Cable television is provided for your entertainment. Private bathrooms have jetted bathtubs.Rec, Spa, Premium Amenities Enjoy a range of recreational amenities, including an outdoor pool, an indoor pool, and a spa tub. 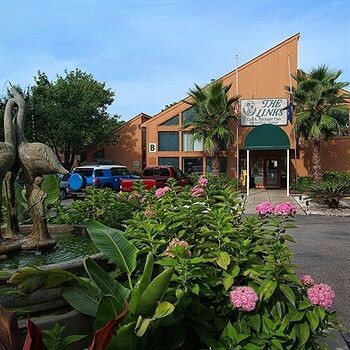 Additional features include complimentary wireless Internet access, an arcade/game room, and tour/ticket assistance.Business, Other Amenities Featured amenities include a computer station and a 24-hour front desk.